Of course every person tries to fulfill the Mitzvos of Tefilin & Mezuzos just like all other Mitzvos. However, there is a distinction between the Mitzvos of Tefilin & Mezuzos, and other Mitzvos. There are countless details concerning Tefilin & Mezuzos, which even if one small detail is missing, it could invalidate them. Read below, and The necessity of inspection to get an idea on how complicated things can get. But even if they are technically Kosher, there is much more to consider, as the following will explain. Tefilin & Mezuzos offer a powerful protection. There are many details concerning the formation of the letters, which although one may have fulfilled the Mitzva without them, nevertheless, these details enhance their power. “The word Shatnez (meaning the letters Shin, Ayin, Tes, Nun, Zayin) form the word “Satan Az”. These are the names of two great harmful forces. The word “Getz” (meaning the letters Gimel, Tzadik) is also the name of an evil force. Therefore, Tagin (crown-like additions) are added to these seven letters, for they are like a sword and a spear against these harmful forces”. Even though these are still considered to be Tagin, and are undoubtedly Kosher, it is preferable for them to resemble small Zayin’s as mentioned above. This is just one example to show how even the most minute detail is important. "The letter Lamed should have two Tagin on top of them, which allude to "Chesed and Din". Therefore, the right one should be taller". By not paying too much attention to what he was doing, or by not taking this subject seriously, the Sofer has according to these Rishonim, God forbid, caused the Midas Hadin to overcome the Midas Hachesed. As mentioned before, this scenario is very common even in the most beautifully written Tefilin & Mezuzos. This is another example how even the smallest of details can make a world of a difference. Tefilin & Mezuzos should look decent; it's as simple as that! The Remah in the beginning of Hilchos Tefilin quotes from the Rishonim: "It is a Mitzva to beautify them from the inside and the outside". It's obvious that if one letter is big while the next letter is small, this is not called "beauty". It does not have to be a piece of art, it rather means that it should be at least a decent consistent handwriting, besides having the technical halachic requirements. In the cheaply written Tefilin & Mezuzos, this is not the case, and although halachacly Kosher, an upgrade in the general look of the Kesav is recommended. 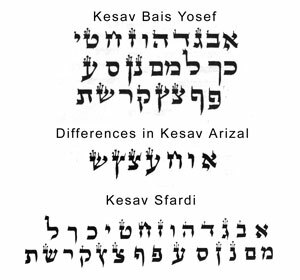 What is Kesav Bais Yosef, Arizal, Sfardi? There are basically four different Minhagim on how to form the letters of the Alef- Bais. It should be noted that Rabbi Chaim Vital writes in his Sefer Sha’ar Hakavanos, that he asked his Rebbe the Arizal about the differences in the various Minhagim of writing, and he answered that they are all true and authentic, and all have deep meanings according to Toras Hanistar. (1) Kesav Bais Yosef: This is the basic Kesav which the Bais Yosef explains in detail in his commentary on the Tur Shulchan Aruch Orach Chaim Siman 36. (2) Kesav Arizal: This is generally the same as Bais Yosef besides seven letters which are slightly different. The main differences being the letters Ches & Tzadik. There is a debate among the followers of Minhagei Arizal whether he meant to institute these differences only by Tefilin, or did he mean in all areas of STAM. Most people today who consider themselves Chasidim, meaning that they follow Minhagei Arizal, will insist on Tefilin being written according to Shitas Arizal. On anything else, meaning Mezuzos, Sifrei Torah, Megilos, they would prefer Kesav Arizal, but would not insist on it, because his emphasis was mainly on Tefilin. Some Chasidim make sure to have only Tefilin Kesav Arizal, being of the opinion that the Arizal himself held that everything else besides Tefilin should be written Kesav Bais Yosef. (3) Kesav Sfardi: This is the Minhag of the Sfardim, which is also called Kesav Vellish. Besides certain letters being written differently, it is also different in style. This Minhag is explained in detail in The Sefer Ledovid Emes from the famous Chida, and in the Sefer Kol Yakov from the Kaf Hachaim. (4) Kesav Chabad: This Kesav which is also called Der Alte Rebbe’s Kesav alluding to the first Rebbe of Chabad Rabbi Shneiur Zalman, famously known as the Ba’al Hatanya, is basically the same as Kesav Arizal but the letters are a little different in style. The Batim in Tefilin are also larger in size then the average Tefilin due to a different interpretation of the required dimension. The Kesher Shel Yad is made differently as well. Why do Tefilin & Mezuzos cost so much money? ; The Hiddur of "B'li Mechikos"
If anyone can just pick up a pen and paper and write Tefilin & Mezuzos, then you should be able to buy a Mezuza for about $5, and Tefilin for about $50. The reality is nothing of the sort. Pen and paper? The Sofrim wish it. A sofer must make a quill, which is usually made out of the feather of a turkey, and must transform it into a practical writing tool, which in itself is far from simple. Every angle of every cut will have an affect on the ink flow. It is literally a science in itself to figure out just the right dimensions. The same goes for the ink. It must not be too thick, it must not be too watery. Any extreme will affect the outcome of the writing. The Sofer must know how to control the right balance. The same goes for the parchment. The process of converting animal hide into a piece of parchment, is a long complicated process. When the parchment finally reaches the Sofer, he must make sure it is not too hairy, nor too slippery. Any one of these extremes will be a major obstacle in producing quality work. Then comes the production of the Batim & Retzuos of Tefilin which undergo a very long and tedious procedure until it is finally fit for use. The know-how and details of any one of the above subjects is a world in itself . And last but not least, the laws which a Sofer must know before he starts writing, are many, and are complicated. One of the most complicated and problematic are the laws of Chok Tochos. What this means is as follows: In the Torah it is stated: “Uchsavtam al mezuzos beisecha uvisharecha.” The Gemara in Gittin Pg. 20 states that with the word Uchsavtam, the Torah is telling us that Tefilin & Mezuzos must actually be written by hand. Each and every letter must be formed through the actual act of writing, and not through erasing or scratching. For instance: If the Sofer wrote by mistake the letter Vav instead of the letter Yud, he may not scratch off some ink from its length in order to shorten it. This is a classic example of Chok Tochos, which means that the letter was formed through the act of erasing and not through the act of writing. Similarly, if a little ink gets caught in a Mem like this: it is forbidden to scratch off the drop of ink connecting the bottom, since this letter is now technically an End-Mem which is only written at the end of a word, even though this still might look to a layman like a regular Mem. In a Sefer Torah or Megila, all the Sofer would have to do is to erase this letter, and then rewrite it properly. In Tefilin & Mezuzos however, it is not so simple. Since the Torah states: “Vehoyu hadvorim ha’eilah”, Chazal explain that the Posuk is telling us that Tefilin & Mezuzos must be written in order. This is the reason why a Sofer must be a very trustworthy person. If a Sofer after finishing writing Tefilin or a Mezuza, notices a mistake he made in the beginning of his writing, he must be willing to sacrifice many hard working hours and start all over again. If a Sofer does scratch away a letter where it is forbidden to do so, there is absolutely no way to detect afterwards what he did. The customer has no choice but to put his full trust in the Sofer that he will do what is right. The Mishna Berura brings from the Chayei Adam that he used to ask his Sofer, never to lift a knife on the parchment at all, even in an instance where it’s clear that scratching is permitted, for fear of this problem. This is one reason why Tefilin & Mezuzos where no mechikos are visible are considered a hiddur. Obviously, a Sofer is human, and humans occasionally make mistakes. But generally, when many mechikos are visible, it is not a positive sign. It suggests that the Sofer is not very experienced. Clean work is always preferable. There are Mekubalim nowadays, who make the connection between mechikos on Tefilin & Mezuzos, and the general well being of the person, especially mechikos which cut into the Sirtut, meaning the lines which are engraved in the parchment before the Sofer starts writing. This idea is similar to the lines on the palm of the hand, which is known to have a negative meaning when they are not whole, and cut off in the middle. This is another reason why some recommend a “clean slate” so to say. All prices in our Purchasing Tefilin section, include quality Batim (boxes) Gasos which means that they are made out of thick hide and can last a lifetime. They also include top quality Retzuos (straps) Avodas Yad (hand made). The cheap Batim Peshutim meaning that the four compartments of the Shel Rosh are made out of thick pieces of parchment glued together, is halachachly questionable, besides being of very poor quality, and is not as durable as the Batim Gasos. Therefore, it is strongly recommended that every effort be made to acquire the Gasos. Similarly, the Retzuos which are not Avodas Yad are questionable and are not recommended. Now, Although all Batim Gasos look alike and are all very sturdy that can last a lifetime, and can all be considered Kosher l’chatchila, there is technically a higher level of Avodas Yad (which is also called Ribuah Regel) which are made manually, and not with the help of machinery. Another quality of these Batim are the four compartments of the Shel Rosh which have an Hashgacha that they are fully separated from each other. These Batim are recommended over the others, but are not a necessity. Many Poskim consider even the cheaper Batim to be considered Avodas Yad due to the fact that the person must control the machine and is therefore still considered manually made and is not lacking the concept of them being made Lishma. The fact of the Batim Shel Rosh being totally separated is merely a Hiddur, and being only mostly separated is halachachly fine. The option of acquiring these Batim is available in our Purchasing Tefilin section from Level 3 and up. There are Batim which are even more Mehudar than these, which are considered to be an even higher level of Avodas Yad. For more information about them, please contact us. (1) Ashkenaz - has the Kesher of the Shel Rosh resemble a Dalet, and the Shel Yad wraps on the arm inward towards the body. Usually, these Kesharim are made on Tefilin which have Parshiyos Kesav Bais Yosef, but not necessarily. 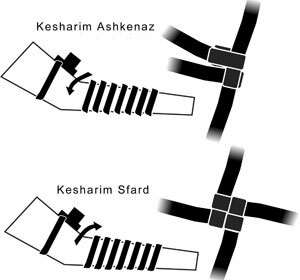 (2) Sfard - for those who daven Nusach Sfard - not Sfardim - which have the Kesher of the Shel Rosh square shaped, and the Shel Yad wraps on the arm outward. Usually, these Kesharim are made on Tefilin which have Parshiyos Kesav Arizal, but not necessarily. (3) Sfardim - for those who are proper Sfardim, which has the Kesher of the Shel Rosh resemble a Dalet, and the Shel Yad wraps on the arm outward. Usually, these Kesharim are made on Tefilin which have Parshiyos Kesav Sfardi (Velish). (4) Chabad - for those who follow Minhagei Chabad, which has the Kesher of the Shel Rosh resemble a Dalet. The Shel Yad wraps on the arm outward, but the Kesher itself is made differently then the others, in a way which permits the loop to be made larger and smaller. Obviously these Kesharim are made on Tefilin which have Parshiyos Kesav Chabad (Der Alte Rebbes Kesav). Before purchasing Tefilin, make sure you are right handed, which would obligate you to put Tefilin on your left arm like most people. If you are left handed, you would put Tefilin on your right arm. If certain chores are done with one hand, while writing is done with the other, or any other doubts on this subject, should be thoroughly discussed with a competent Rav and should not be taken lightly. If you would like us to consult a Rav on your behalf please contact us with the details of your Sha’la and we will present it to a Rav as soon as possible. Why do some people prefer Retzuos which are black on both sides? The most common problem which renders Tefilin Posul, are when Retzuos get worn out and loses its blackness. Retzuos must always be maintained to keep its required black color. Therefore, some people prefer the Retzuos which are black from both sides, for they are soaked in the paint through and through, and can not possibly wear off. This Minhag is not something new. The opinions of the Rambam and other Poskim, as well as the Arizal himself brought in Sha’ar Hakavanos, are that Retzuos should be black on both sides.